How will you distinguish between Dicot Plants and Monocot plants morphologically and anatomically? In this article I gave clear cut differences between Dicot plants and Monocot plants to distinguish them easily. I gave wide range of morphological differences as well as anatomical differences between the two groups of plants. To make the differences very clear I even included diagrammatic evidences also. Dicot plants and Monocot plants are two major group of plants which belongs to Angiospermae. Even though both these groups belong to Angiospermae they differ distinctly from each other in a number of characteristic features. 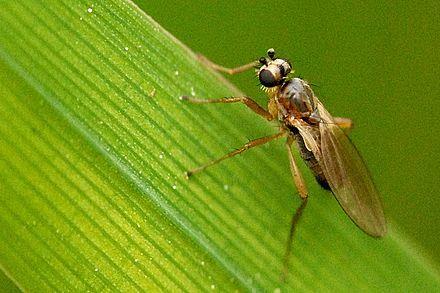 By knowing these features we can easily distinguish and identify them. 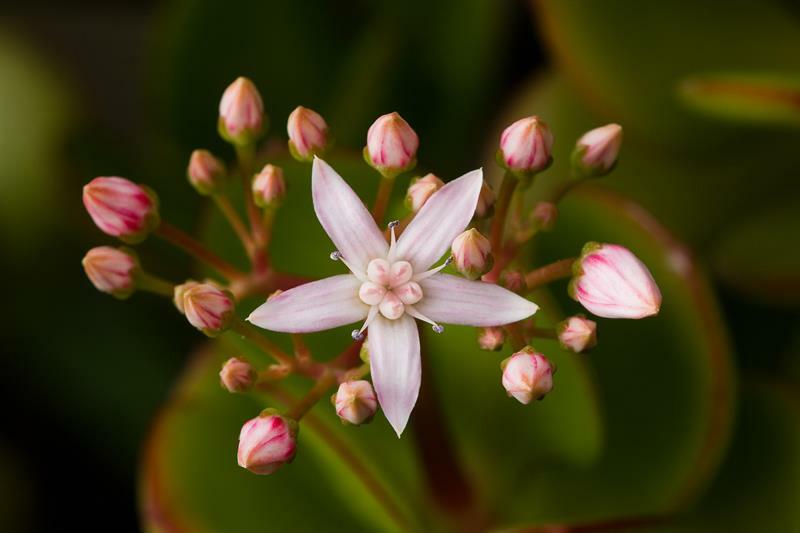 All Monocot plants develop from seeds with only one cotyledon. Ex:-Rice, Maize, Wheat, Grass etc. All Dicot plants develop from seeds with two cotyledons. Ex:-Groundnut, Bean, Pea, Castor etc. All Dicot plants show a characteristic Tap Root System in their plants. A Tap Root System is one which posses a bulky mother root or Primary root followed by thin Secondary roots, Tertiary roots and root hairs. The tap root develops from the radicle of the embryo of dicot seed. 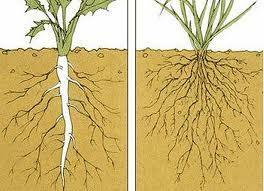 All Monocot plants show a characteristic Fibrous Root System in their plants. A Fibrous Root System doesn't possess any mother or tap root but include long equally dimension-ed roots in a tuft which originate from the stem base of a Monocot plant. The roots appears to be long thin fiber like with numerous root hairs. The initially grown tap root from the radicle of the embryo of monocot seed degenerates and is replaced by thin fibrous roots. All Dicot plants show leaves with Reticulate venation. In reticulate venation, many veins originate from the midrib of a dicot leaf and these veins interconnect or anatomose with each other to form a web like network. 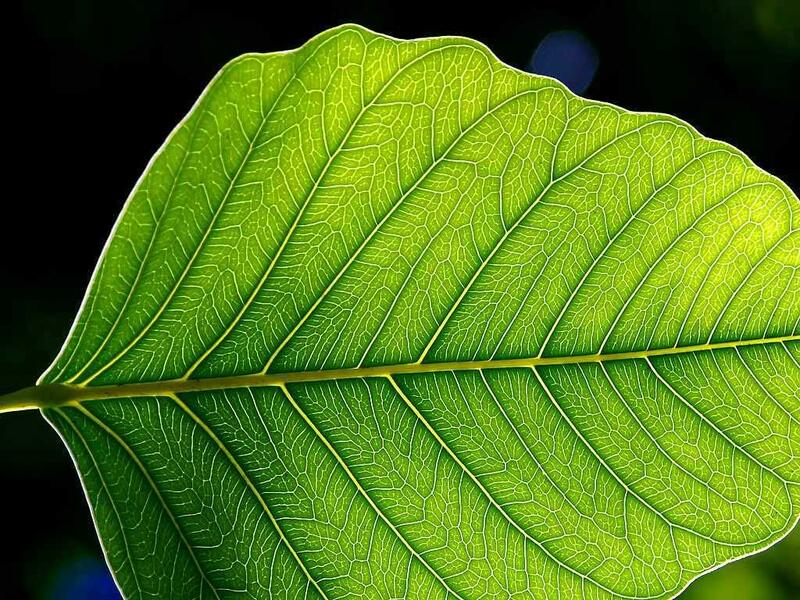 The midrib and veins of a leaf are made with two conducting or vascular tissues like Xylem and Phloem. Xylem tissue is meant to carry water and minerals from the roots to the tissue of the leaf. Similarly Phloem tissue is meant to carry the prepared food from the leaves to other parts of plant body in the form of dissolved glucose. Similarly all Monocot Plants show a characteristic Parallel type of venation in their leaves. In Parallel type of venation no midrib can be found in a leaf but similar veins originate from the base of a Monocot leaf which extend to the tip of the leaf and these veins are arranged in a parallel way. We cannot find a net work like veins as found in a Dicot leaf. All Dicot plants produce Pentamerous flowers. Pentamerous flowers are those flowers which include five parts in every whorl of the flower i.e. five sepals in the first whorl Calyx, five petals in the second whorl Corolla, five Stamens in the third whorl Androecium, five carpels in the fourth whorl Gynoecium. 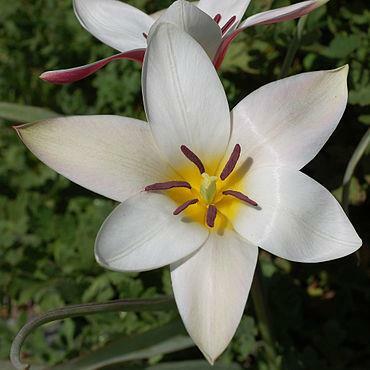 Usually all Monocot plants produce Trimerous flowers. Trimerous flowers are those flowers which include flowers with three parts in each whorl of the flower i.e. three sepals in the first whorl calyx , three petals in the second whorl Corolla, three stamens in the third whorl Androecium, three carpels in the fourth whorl Gynoecium. If more than three members are there in a whorl then every part will include two whorls of three parts each i.e. if six sepals are there in the flower, two whorls of three sepals can be found in the flower and likewise all other floral members can be found in two whorls in a trimerous flowers. Stomata are microscopic openings present on the surface of plant leaves for exchange of respiratory gases and for carrying out transpiration. 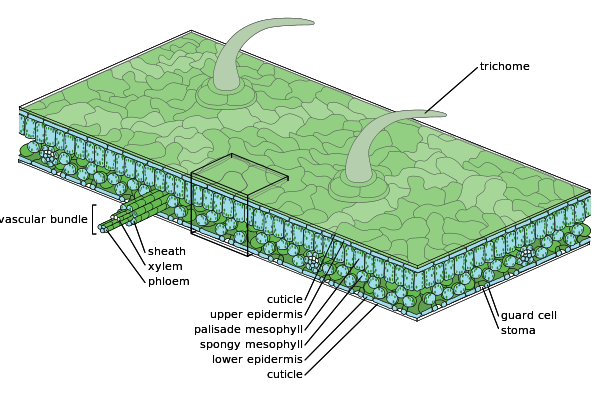 Stomata in the leaves are formed by two specialized cells called guard cells. 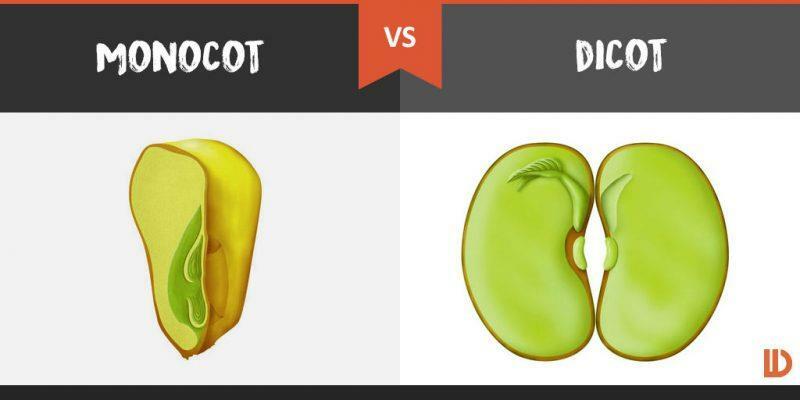 In Dicot plants, the shape of guard cells will be large Bean shaped or Kidney shaped cells which include a gap in between them called stoma. But in Monocot plants, the stoma of leaves are formed by two Dumbell shaped guard cells. By observing the shape of guard cells under microscope we can identify the type of leaf. In a Dicot stem the vascular bundles are limited in number and are arranged in the form of one or two rings. But in Monocot stem the vascular bundles are numerous and are scattered in the ground tissue of stem. In both Dicot and Monocot stems, xylem and phloem tissues together found in the form of vascular bundles. In Dicot roots and Monocot roots xylem and phloem bundles are present separately. In Dicot roots xylem and phloem bundles are limited in number but in Monocot roots xylem and phloem bundles are more in number. In leaves of Dicot plants mesophyll tissue (Photosynthesis carrying tissue) is comprised of Palisade parenchyma and Spongy parenchyma tissues. But in leaves of Monocot plants mesophyll tissue is undifferentiated and consists of only Spongy parenchyma. Seeds of Dicot plants include two cotyledons while seeds of Monocot plants include single cotyledon. Dicot plants show Tap root System whereas Monocot plants show Fibrous Root System. The leaves of Dicot plants show reticulate venation whereas leaves of Monocot plants show Parallel venation. Dicot plants include Pentamerous flowers while Monocot plants include Trimerous flowers. 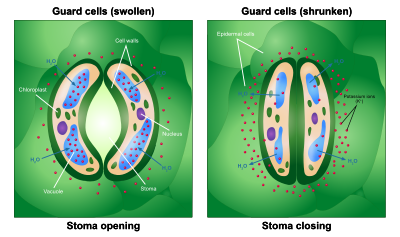 The guard cells which form stomata of Dicot leaves are kidney shaped while guard cells of Monocot leaves are dumb-ell shaped. The vascular bundles found in dicot stem are limited in number and are arranged in the form of a ring whereas the vascular bundles of Monocot stem are numerous and are scattered. 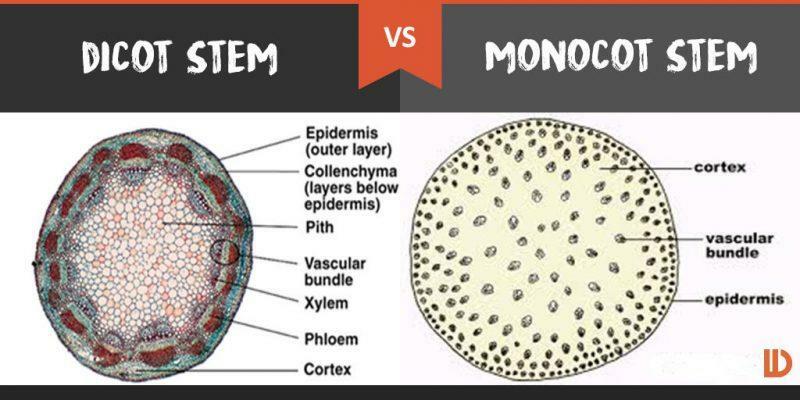 Xylem and Phloem bundles of Dicot roots are limited in number while they are more in number in Monocot roots. Mesophyll tissue in a Dicot leaf is differentiated into Palisade Parenchyma and Spongy Parenchyma but in Monocot leaf the mesophyll tissue include only one kind of tissue i.e Spongy Parenchyma. How do the leaves of monocots and dicots differ in cross-section?